This is a great side dish for dinner this weekend. If you want tender beans, blanch them in hot water for about 30 seconds before tossing with tomatoes and herbs. 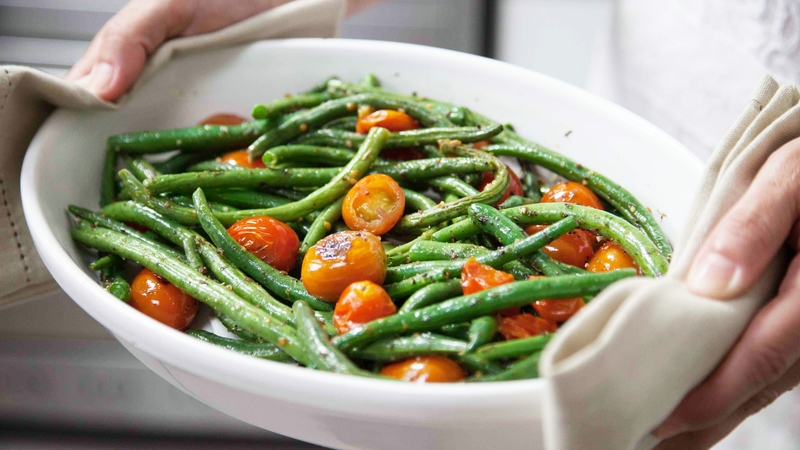 Watch: How to roast green beans. Journalists: Broadcast-quality video 1:11 is in the downloads. Nutritional information per ½ cups: 59 calories; 3 g total fat; 0 g saturated fat; 0 g transfat; 2 g monounsaturated fat; 0 mg cholesterol; 132 mg sodium; 9 g total carbohydrate; 3 g dietary fiber; 4 g total sugars; 2 g protein.